I teach art workshops throughout the year at ﻿Blue Raven Art School ﻿ which recently relocated to 720 E. Prince Rd (just off 1st Avenue). The workshops fall into two categories: self-publishing and art. 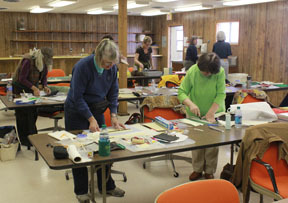 In the arts category, I teach Artist's Books; Mixed Media; and Relief Printing. See below for a detailed description of each workshop. You can register for my workshops on the Blue Raven website BLUE RAVEN Registration. You will be sent a list of required and optional tools to bring to each art workshop. I provide materials such as paper, inks, etc. Think about the following questions before coming to the workshop: 1) what kind of book do I want to publish (e-book, hard cover, paperback, all three), text only or with images? ; 2) do I want to try to sell my book to the public or am I writing primarily for friends and family? 3) do I want to sell only through Amazon or "go wide" and offer my book to other venues such as libraries and bookstores? This introductory workshop in self-publishing will assist participants to consider and set self-publishing goals; discuss the e-book only market; review major POD (print-on-demand) companies; discuss interior text formatting options; consider proofreading/copyediting; discuss cover graphic design and formatting options; consider related topics such as ISBNs, copyright issues, print requirements (CMYK vs. RGB), e-book text conversions and file options; getting reviews for your book (including ARCs); and a beginning look at book marketing. 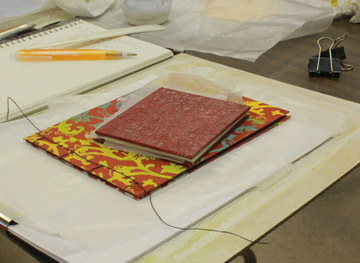 These book arts classes are an intensive introduction to many of the basic structures used in most artist’s books. Expect to come out of these classes with several models, but not necessarily a finished work of art. A minimum of three students is required for each session. 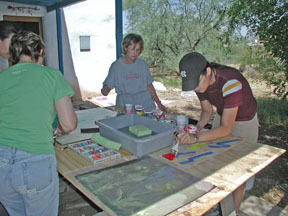 The first session on papers, tools, and basic structures is required for those with little or no book arts experience. In other words, please learn the foundations first before taking a more advanced class. 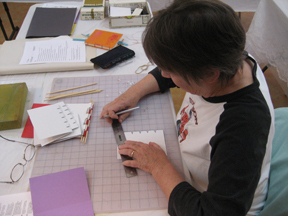 Introduction to Artist’s Books: In this introductory workshop, we will learn about materials, especially paper choices, and also how to use book maker’s tools. We will learn how to make a book cover with mitered corners. 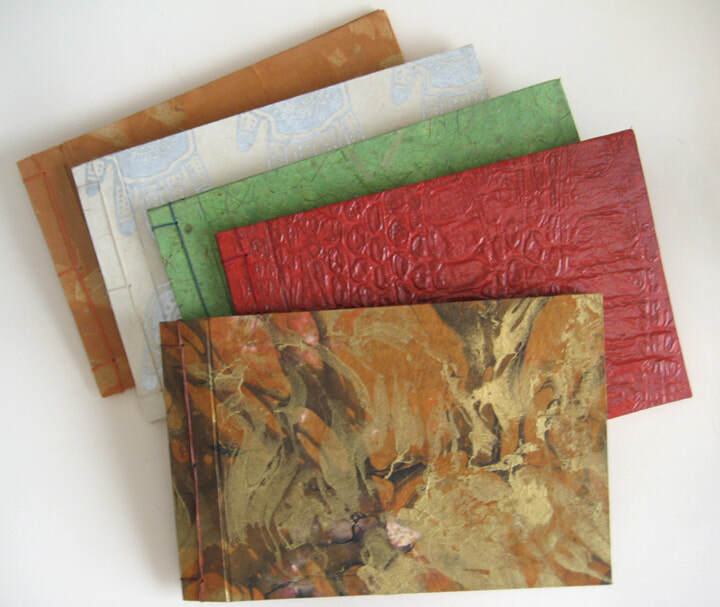 We will learn how to create accordion and concertina book structures, Japanese pouch-bound books, and accordion bindings with pamphlet stitching. 3 hour class; minimum of 3 students required. Experimenting with Accordion Books: We’ll create three books in this class, all based on the accordion. We’ll start with an easy accordion-style book created from one sheet of paper and then add some variations. Next we’ll make an accordion pocket book with insertions. Finally we’ll create a multi-layer star book (also known as a carousel book), also with variations. 3 hour class; minimum of 3 students required. 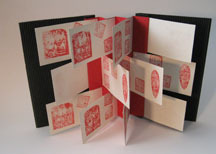 Flag and Tunnel Books: In this class, we will expand upon the basic concertina structure to create two very different kinds of artist’s books: the flag book invented by Hedi Kyle, and the tunnel book. We will experiment with variations on the flag book, including creating a picture frame book. 3 hour class, minimum of 3 students required. 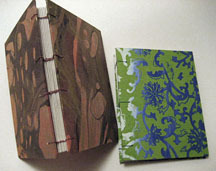 Hinged Books: In this class we’ll create two books with hinge bindings – the Hinge Bound Book and the Piano-Hinge Book. Both have endless possibilities for experimentation and innovation. 3 hour class; minimum of 3 students required. 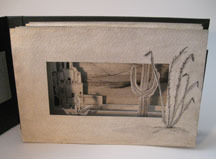 Border Book: This is an old structure that has been modernized for contemporary book artists by artist/author Keith Smith. We’ll learn how to construct the cut, folded, and sewn border book in this class. 3 hour class; minimum of 3 students required. 4-Needle Coptic Bound Book: The traditional Ethiopian Coptic binding used four or six needles. We’ll follow this method to create a blank Coptic bound book. 3 hour class; minimum of 3 students required. This is an advanced course. 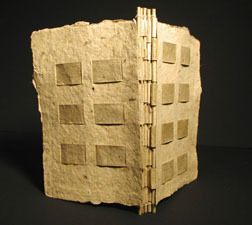 You must have taken my Introduction to Artist's Books course first, or be an experienced book artist. 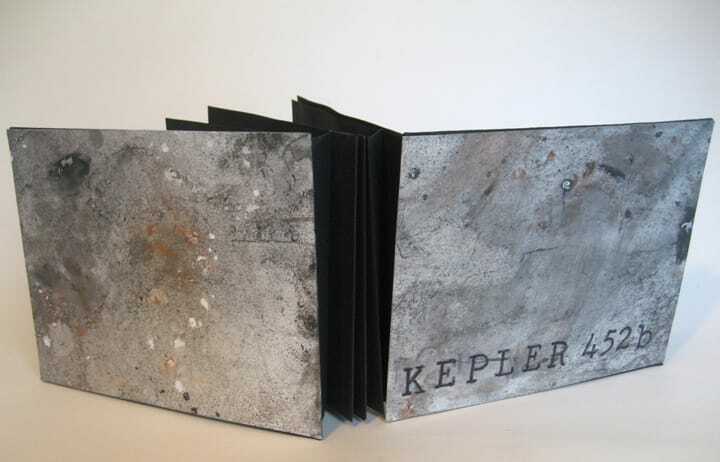 Word and Image in Artist’s Books: We’ll take up the subjects of writing words for an artist’s book and creating images for an artist’s book and how to combine the two to make an integrated and organized whole artwork. 3 hour class; minimum of 3 students required. Innovative Collage: We’ll experiment with various methods to create visually compelling and unique collage paintings on paper and canvas. 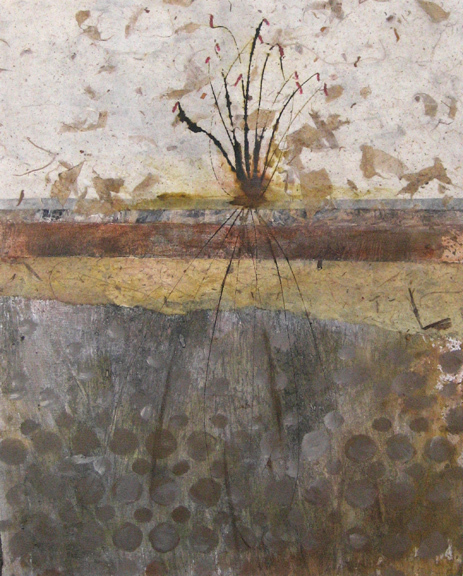 These methods include using pre-painted papers, botanical papers, found papers, and found objects with techniques such as transfers, and fiber-related techniques. 3 hour class; minimum of 3 students required. Surface Design on Paper: We’ll learn techniques such as pochoir, masking, resist, collagraphy, stamping, and sgraffitto combined with use of unusual materials such as graphite, inks, pastes, and various unusual mark-making tools to create unique paper surfaces.. This is a good workshop to take before taking the workshops on artist’s books. That’s because the paper you produce in Surface Design on Paper can be used to create your artist’s books. 3 hour class; minimum of 3 students required.